Shooting glasses play a major role in providing necessary eye protection for shooters and hunters. Whether you are at the range or outdoor shooting, you need these glasses. There are several glasses in the market today which can be worn but aren’t as effective as specified the quality shooting glasses. This is because normal glasses are not impact resistant and lack necessary designed to offer side protection of the eyes. So, what are the best shooting glasses for the money of 2019? Most of the shooting practices occur at close proximity to the face such as handguns which are held at an arm’s length. This exposes the shooter to various harms like flying objects, dust, wind, sun and gun recoil. To avoid such hazards, it is recommended for one to wear protective shooting glasses. You also need ear muffs if you do any sound related work. 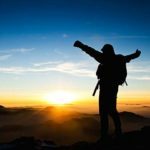 2 How to select the Best shooting glasses? 2.2 What color’s of Shooting glasses should I get? 4 Why Wear Shooting Glasses? How to select the Best shooting glasses? Not only do shooting glasses provide eye protection but they as well enhance a shooter’s or hunter’s view of their target. This is why it is a mandatory for shooters participating in a shooting competition to wear impact resistant glasses. Since there are hundreds of shooting safety glasses available in the market, choosing the best can be challenging. In the next paragraph, we have highlighted some of the vital features and factors you should consider in selecting the top shooting glasses for your purpose or designated environment. First of all, the shooting glasses should be impact resistant. This feature comes with the lenses and it is rated by several agencies. The most notable rating agency is the American National Standards Institute (ANSI). It recommends at least a rating of Z87.1 plus (ANSI Z871+). Also, the glasses should be designed in a way that ensures they cover much of your eyes. Furthermore, a great and common feature found in almost all shooting safety glasses is that they are made from polycarbonate material. Polycarbonate is a strong material and ensures the longevity of the glasses. In addition, every type is able to offer at least 99.9% protection from dangerous UVA-UVB light. What color’s of Shooting glasses should I get? 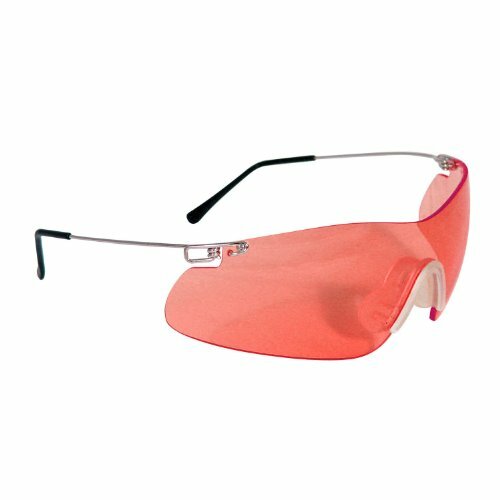 Orange safety glasses: the orange tint helps to bar out blue light and haze and in the long run giving a better orange target. It is suitable for shooting orange clay targets and is used by many shooters. Pale yellow: the role of this tint is to brighten and contrast colors in low level lighting, which can be used at sunrise, sunset or in the evenings under artificial light. Similar to orange, this tint can be found in many protective glasses. Medium yellow lens: it is suitable for contrasts in dim light or when overcast. It is also desirable for enhancing orange clay targets. Clear: Colorless or clear tints come with a mirror coating that lowers glare and reflects light. It is ideal for use in both indoor and outdoor areas. Light purple: this color provides a clear contrast to the orange of the target. It emphasizes on a background of tall trees, as it is likely to dampen the green of the foliage and at the same time better the orange of the clay target. Dark purple: It works perfectly in snow and at a place with bright sunlight as it highly betters orange in the sky and lowers glare. Grey/smoke safety glasses: this is another commonly used tint. It blocks glare and is ideal for using in the bright light area. Vermillion: this is a widely used tint which performs outstandingly in poorly lit backgrounds, like in the presence of trees. It is great for any person with red to green color blindness. The above factors will ensure that you get the quality glasses of your choice at a very favorable price. As well, we came up with five different shooting glasses which we think are the best in the market. Featured with five interchangeable lenses which include; copper, clear, amber, green and orange, this is the best shooting glass for any kind of environment or weather. Its various lenses exceed the Z87.1+ set standard. Furthermore, its kit comprises of a neck cord, a cleaning cloth, additional nose-piece, a storage case and the five interchangeable lenses that we have just talked about. They have a sleek design and are very comfortable to wear as you shoot or hunt in different weather or environments. Though it has a higher initial cost, but its great performance is worth every single coin spent on it. Despite having top quality features, the Wiley-X saber comes at a very favorable price when compared to its competitors with similar features. It is durable as it comprises of shatterproof optics which are very impact resistant. They also meet the protection standards for ML-PRF-31013. Proper protection of the eye is fully enabled through the nylon based triloid frames. For vision protection, it has lenses blocking out 400 nanometers of the dangerous UV light rays. Other features include; a padded nosepiece, and 3 interchangeable lenses. 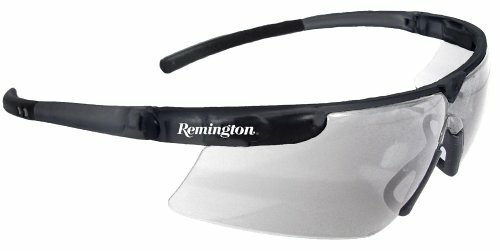 It’s not a surprise that we have two Remington shooting safety glasses on our list. 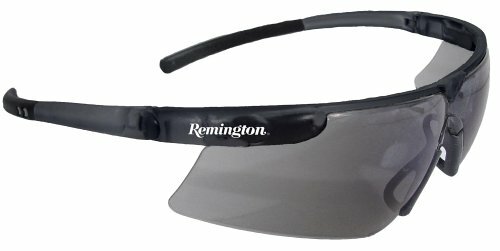 Remington is one of the top producers of shooting glasses in the market. The Remington T-72 has a sleek design that is really captivating to the eye. They provide excellent eye protection and have smoke lens which blocks glare and are great when used in bright light. It has a lens which is created using impact resistant polycarbonate material. In addition, the lens provides 99.9% UV protection and exceeds the set ANSI Z87.1+ requirements. Remington T-72 as well have a wraparound lens which gives an enhanced shooting view. With the vermillion lenses, the Radians clay pro shooting and safety glasses can be applied in diverse ways. First of all, they are ideal for people with red to green color blindness. They can also be applied in poorly lit areas. They comprise of a 7 base wraparound unilense to provide a clear shooting view. The vermillion tinted glasses meet and exceeds the standards set by the ANSI Z87.1+. Other key features that they contain are a rubber nosepiece and silver metal temples. Their initial price is favorable and they are as well highly rated by their users with a great satisfaction. As sporty as the Remington T-72 shooting glasses look, they really offer great protection to our eyes as we shoot. They have a clear lens which is ideal in use both indoor and outdoor. Furthermore, the lens offers 99.9% UV protection. The lens is made of an impact resistant polycarbonate material which not only matches but surpasses the ANSI Z87.1+ set standards. These glasses can as well be bought together with lenses of copper, silver, amber and clear tints. For an accurate shooting view, the glasses contain wraparound lens. Finally, it has a hard coat lens that is scratch resistant. When out hunting or on the shooting range, wearing eye protection is really important. Things like dust, sun and wind can distract you or even cause harm when taking your target. That is why wearing shooting glasses is very vital. If you want to avoid eye and vision issues, then ensure that every time you are out there in the field, forest or at a shooting range have shooting glasses with you. In this post, we are going to look at the importance of wearing shooting glasses and what to look at to ensure that you get the best shooting glasses. The glasses don’t just protect an individual during shooting or gun use, but as well when just walking out there in the forest or woods. In the wild, there are lots of dangers that can potentially injure a person’s eyes. Things like stray branches, leaves and twigs can as well harm our eyes if not protected. Even when cleaning a firearm, it’s a great thought to put on glasses so that they can secure your eyes from cleaning solvents or even springs that come loose. Great deals of hunters are hit with an errant birdshot or a ricochet. Also, excessive powder can blow back and as a result burn your eyes. In addition, eye glasses will protect the eyes when used cartridges are ejected from the firearm. Just a small muzzle can bring damaged to the eyes. So, wearing shooting glasses protects shooters eyes from getting damaged. 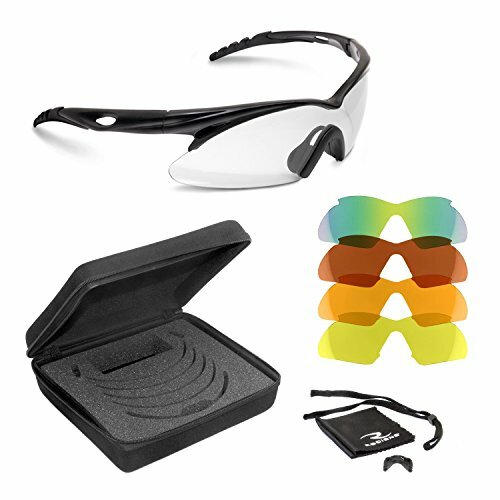 During target shooting, a quality pair of shooting glasses can provide a great contrast. The yellow glasses will change the white on a black and white target yellow, but the black remains that way. There are a number of shooters who state that this offers a better contrast and will better accuracy. There are various types of shooting glasses to choose from on the market. They vary in quality and durability. It is important to select a pair of shooting glasses that fits you well and serve your purpose. If you are a shooter, there are glasses for you so are the hunters. Some of the factors to consider include: lenses of the glass, frames, design, durability, and certification. The best material to choose from is polycarbonate. Ad is the strongest. The popular design on the market at the moment is the wrap-around style glasses that are very close to the face with a very small opening, so that they can prevent things from entering and hurting your eyes. But still, there is enough airflow to prevent the glasses from fogging. This works amazingly. The best shooting eye wear is made with lightweight frames that are created from titanium or plastic material. In order to provide users with a variety, the lenses are made in different colors such as amber, purple, gray, yellow and amber. Choose a pair of glass with nose pads that are adjustable so that the frames rest in an optimum position. The importance of a polycarbonate lenses is that they are scratch resistant and have a built in ultra violet protection that protects the user from ultraviolet rays. So, if you want to make sure that your eyes are well protected during shooting or while out in the wild, pick a quality pair of eye wear and save your vision from sharp and dangerous objects that can harm it. Before you acquire best shooting glasses, first, you have to understand how effective they will be for your intended application. Know your environment very well and acquire glasses that will perform excellently in it. The glasses should be comfortable enough and should fit you well. But the most important factor that they should possess is to be very protective to the eye. Whether you’re a shooter or hunter, there are various safety precautions that you need to look at when operating firearms. The two most important protections include protecting your ears and eyes. During shooting, you endanger your eyes and face from residues from the gun and other debris that can cause injuries. Thus, putting on eye protection every time you hunt or shoot will secure your eyes from such potential damages. But this is not the only role of these glasses. Shooting glasses can as well offer great optical clarity and protect you from dangerous UV rays. Question: What should I consider when buying shooting glasses? Answer: It is important that you select the best shooting glasses with the best features. Make sure that the shooting glasses have a single-piece lens which covers both eyes, fits the contours of your eye area very well, it should be classified to offer UV protection, Meet one of the three standards (U.S. MIL-PRF-31013 or European EN166 or ANSI Z87.1 standards), and also, they should not be straining to see. Question: What is the American National Standards Institute Z87.1? Answer: When shopping for professional eyewear, you may come across the “ANSI Z87.1”. This is a standard rating and it is important you look out for the rating on the glasses before buying them. ANSI Z87.1 is the United States Civilian Standard of eyewear protection. A pair of glasses that meet the ANSI Z87.1 standards have been tested and confirmed to provide protection against fine objects. The fine objects, which can be identified as “impact” or “non-impact,” include mist, dust, droplets, liquid splashing, and optic radiation. Therefore, is a glass is rated as “ANSI Z87.1+,” it has been tested and passed high-impact tests. Question: My shooting glasses tend to fog up at certain times of the day or year, what should I do? Answer: There are lots of anti-fogging solutions that you can use. Alternatively, you can use hand soap. Note that blinders increase the fogging issue and water condenses from perspiration from your forehead. You can as well use an antiperspirant on your forehead, which might help to some extent. Question: If my shooting glasses are not the snug fit, Can I adjust them by myself? Answer: You can search and follow some instructions on how to adjust your shooting glasses. A small pair of pliers and proper instructions is enough for you. But it is a great idea to get a vendor who sells glasses to adjust them for you so that if anything goes wrong, they are to blame and not you.